Methylphenidate, also known as Ritalin or Concerta, is a stimulant medication used to help people with ADHD and narcolepsy. People who abuse methylphenidate to party, study or lose weight can develop a substance dependency. How much does the recovery center cost? How am I going to pay for it? What kind of program is the best for me or my loved one? How does the treatment process work? What can I expect once I’m in rehab? What other factors are important to me in a methylphenidate rehabilitation center: location, staff, amenities, family involvement, etc. Who Answers? to talk to a trained specialist about finding a methylphenidate recovery center for you or someone you care about. Methylphenidate is the generic name for prescription medications used to treat attention deficit hyperactivity disorder (ADHD) and narcolepsy. 1 Brand names of medications with methylphenidate as the active ingredient include Ritalin, Methylin and Concerta. People who use methylphenidate as prescribed by their doctor should not have problems with abuse. However, many people take methylphenidate non-medically for its stimulant effects, which include increased wakefulness, increased focus and decreased appetite. Abusers may experience and show signs of some of these effects in their behavior. When use becomes extreme, the effects may be even more pronounced, especially when combined with alcohol. It is vital to seek treatment for methylphenidate abuse as soon as possible to prevent lasting damage and escalating addiction. Methylphenidate addiction treatment costs differ according to the program that you select. Location of the program will play a major role in the cost. Programs in cities tend to be more expensive than programs in the suburbs or countryside. Inpatient programs, which are recommended for severe stimulant addictions, tend to cost more than outpatient programs. Length of time will also affect the cost of treatment. Longer treatment plans will cost more than shorter plans. Cost will depend on the program you select. One major way to help with treatment costs is through insurance. Government-organized insurance plans all cover substance abuse treatment to different degrees depending on your particular plan and the state that you live in. Even Medicaid and Medicare, the free insurance plans for low-income and elderly people, cover substance abuse screening and part of treatment. The Affordable Care Act requires that insurance agencies cover substance abuse treatment to the same extent that they cover other medical treatment. If you have a private insurance plan, call 1-888-319-2606 Who Answers? to find out the extent of treatment coverage offered. Find a program that offers a payment plan so that you can divide payments across many months, lessening the initial cost burden. Find a program that offers sliding scale costs, meaning treatment costs are dependent on your income. This means that if you have a lower income, the price will be lower to help you afford treatment. You can also use other financing options such as credit cards and loans to cover the cost of treatment. Some programs will offer rehab scholarships. Treatment programs want you to discover a satisfying sober life, and many will offer as much help as they can to get you the treatment that you need. Treatment for methylphenidate addiction will be different for each person. Stimulants in particular require an adaptive treatment plan to account for individual needs. Everyone begins abusing drugs for different reasons, and the type of treatment that you choose must account for these reasons. Abuse of methylphenidate can give rise to tenacious addictions. Inpatient treatment is a desirable recovery option for many. Inpatient methylphenidate rehab involves going to a facility to stay for a period of time. Outside contact is not allowed so that you can focus entirely on your recovery. Standard, non-hospital based inpatient care, also called residential treatment, can involve 30-day, 60-day, or 90-day stays, depending on your treatment needs and severity of addiction. Throughout your time you will receive a high level of care and medical monitoring as well as engage in group and individual therapy. Understand and address your reasons for abusing. Develop a sober support network that cares about your recovery success. If privacy, comfort and amenities are a major concern for you, luxury inpatient programs may be the best choice. These programs place major emphasis on making sure you are comfortable and entertained, while still providing an escape from work and home life. If you need access to work while in recovery, then an executive or CEO inpatient program is the right choice. These are similar to luxury programs in terms of comfort and amenities. But they also allow you access to work, including Internet and meeting rooms. If taking a break from home and work life isn’t an option, outpatient rehabilitation programs can provide the treatment that you need. Many outpatient programs offer counseling and therapy sessions multiple times a week for recovering users. Partial hospitalization, a form of outpatient, involves required facility medical check-ins and therapy sessions multiple times a week to keep you on the abstinence track. Partial hospitalization programs give participants access to certain hospital-based services for part of each day throughout the addiction treatment duration. If you believe that you need stricter monitoring to ensure your sobriety, then an intensive outpatient program may be right for you. These rehab programs may monitor sobriety with weekly drug tests as well as medical and counseling check-ins. They also provide addiction education and job training to help you get back on your feet. 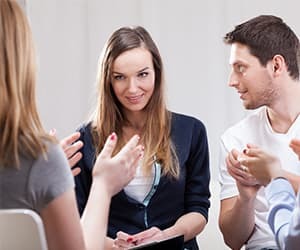 Many people who have completed residential programs, and later experience some post-treatment recovery setbacks, often enroll in intensive outpatient programs to get back on track. Self-help groups offer ongoing support for recovering users. Twelve-step programs – such as Alcoholics Anonymous – follow a set of steps to help recovering users stay on the abstinent path. Narcotics Anonymous and Pills Anonymous focus on drug abuse. Who Answers? to speak with a specialist about finding the right recovery program and paying for treatment. Intake. You meet with an addiction professional from the program to discuss treatment options and set a treatment plan. Therapy. Treatment therapy will help you sort out why you began abusing methylphenidate and how to avoid returning to it. You will learn relapse prevention skills, how to deal with cravings and how to cope with future abuse temptations. Mental health. Methylphenidate addiction is associated with mood changes, aggression, depression, anxiety and potential hallucinations. 1 So it is vital that your treatment also address any and all mental health issues that come up. Aftercare. Ongoing therapy sessions, both group and individual, can provide huge benefits to your recovery process. You should also consider attending community-organized self-help meetings to build up a sober support network. Sober housing arrangements can be made if you are worried about relapse temptations. Medications such as antidepressants, anti-anxiety medications and sleep aids may be used to help with the unpleasant symptoms of methylphenidate withdrawal, which can include restlessness, fatigue, insomnia and bad dreams. Location. Do you want to stay close to home or take a break from everything? Some people need an escape from the original abuse environment to focus on recovery, while others prefer the comfort and familiarity of home. Staff. Ideally, all staff members should have experience in substance abuse treatment, including a degree in a related field (psychology, psychiatry, social work, etc.) as well as training hours in substance abuse counseling. Family involvement. Do you want your family involved in your treatment? Some people find family involvement helps them during recovery, while others prefer separation from family members during treatment. Specialization. Does the program specialize in methylphenidate treatment? Individualized treatment plans aimed specifically at methylphenidate addiction or similar prescription drug addictions will offer you the best recovery. It is important for teens to find a program that engages the family in the treatment process. Teen programs come in all shapes and sizes: inpatient, outpatient, 12-step and even wilderness programs where treatment occurs in a camp-like setting. Teen methylphenidate addiction can sometimes be related to issues within the family structure. So it is important to find a program that engages the family in the treatment process. In addition, many adolescents struggle with mental health issues. Therefore, a program experienced with treating dual diagnosis conditions may also be beneficial in recovery. Many young people are able to get prescription ADHD medications in spite of not having a doctor’s recommendation. This is a big problem that may give way to widespread abuse. But where do they get the medications? 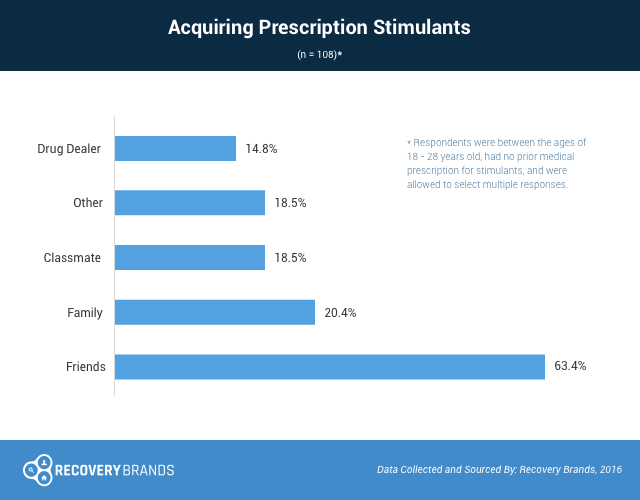 According to a survey conducted by Recovery Brands in 2016, the majority of people between the ages of 18 and 28 get access to doctor-prescribed stimulant medications from a friend. Almost 20.5% get them from family, less than 20% from other students, and about 15% through a drug dealer. People who have a prescription are advised to keep track of their ADHD stimulant medications to prevent misuse. Methylphenidate abuse can lead to serious life consequences. If you believe you or someone you love has a problem with methylphenidate, call 1-888-319-2606 Who Answers? right away to speak with one of our specialists about getting into a recovery program.
. Johnston, L. D., O’Malley, P. M., Bachman, J. G., & Schulenberg, J. E. (2013). Monitoring the Future national results on drug use: 2012 Overview, Key Findings on Adolescent Drug Use. Ann Arbor: Institute for Social Research, The University of Michigan.
. Ferreira, R., Bassi, G. S., Cabral, A., & Nabre, M. J. (2010). Withdrawal from methylphenidate increases neural activity of dorsal midbrain. Neuroscience Research, 68 (4). 290-300.